The universal head piece: Makes one single head piece suitable for up to 12 different door widths. Every door width requires a different head piece. Fastening system: the Amargófastening device makes it a lot easier to place the frames. 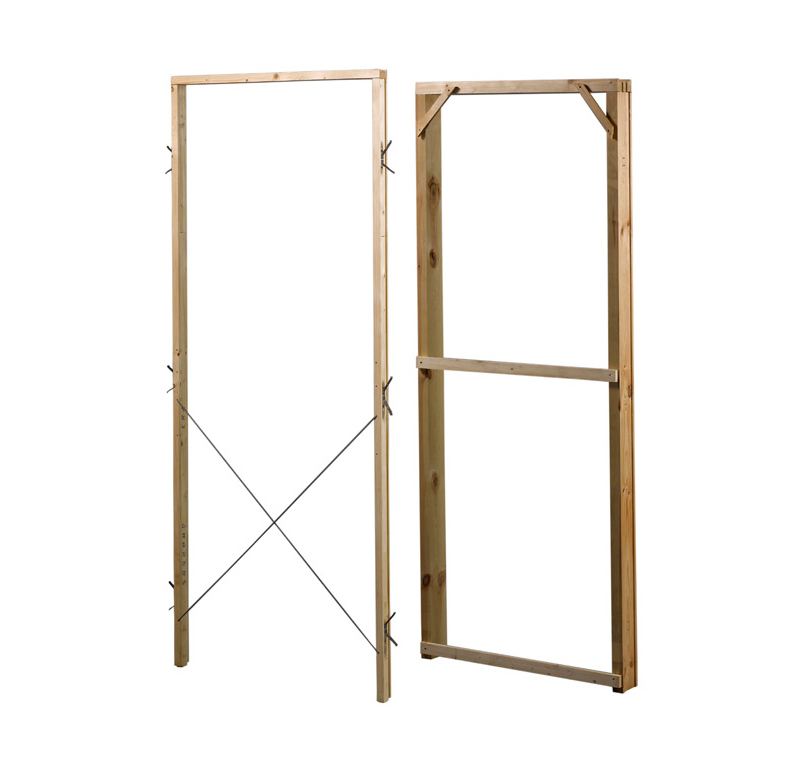 Unlike normal frames, Amargóframes come with a pre-installed fastening device to fix the frame to the wall. This is labour saving and ensures that the timber remains intact as there is no need for other external fasteners. Transport is convenient and safe because the fastening devices do not affect transport or storage in any way. Furthermore, as they are an integral part of the frame it is impossible to lose any pieces, a common occurrence with external fittings. Fastening system: the frame is fastened to the wall with nails or traditional hooks, which are usually set into the wall by the builder with a hammer. This can damage the frame as it is being installed. Transport: by assembling the frame onsite, transport and storage costs are significantly lower than if the frames are supplied pre-assembled. A trailer can carry up to 4000 unassembled frames: they take up 8 times less space that assembled frames. Transport: Frames are transported to the building site already mounted; this means that a trailer can take only about 500 frames. Made using PEFC certified lumber: In 2009, Amargówas awarded the PEFC ((Programme for the Endorsement of Forest Certification) Chain of Custody certificate for forestry products. This international certification guarantees that all the primary material used by the company is sourced only from sustainable forestry Primary materials not sourced from sustainable forestry.